Did you know that the horses in Congress Park were not always there? No, not real horses, but the basswood beauties that make up the Congress Park Carousel. In 1910, Marcus Charles Illions carved 28 horses to craft a carousel with the intention of "wowing" children of all ages. Illions is widely considered to be the one of the greatest carousel carvers in the world, and his ponies are most known for their dazzling heads (each one carved by Illions himself) and well-decorated bodies. These 28 horses even featured real horsehair tails! For 77 years, children of all ages enjoyed riding Illions' carousel at many Saratoga County venues. In 1987, the future looked pretty unpromising for these gorgeous horses. At that time, Kaydeross Park on Saratoga Lake, home to Illions' ponies, was unfortunately being sold for development. Eventually, it was decided that the carousel was going to go straight to the auctioning table and the horses would be released from their paddock one by one. Before these purebred horses were released into the wild, local townspeople and the former Department of Public Works Commissioner, Tommy McTygue, agreed to present a bid to keep the gang in Saratoga Springs. The only thing standing in their way? Money. Working fast, McTygue and other volunteers went into town to local stores and residents to see if they could raise the necessary funds. In a few weeks, the Saratoga Springs community raised close to $120,000. The community offered the auctioneers $150,000 for the complete carousel, including the 28 horses. After some negotiation, the bid was accepted and the carousel found its new home in Congress Park. The carousel underwent restoration after its move from Saratoga Lake and reopened in 2002. Today the Congress Park Carousel is open seasonally, from the beginning of May though Columbus Day each year. For some good old fashioned fun, you can ride the carousel for just 50 cents a spin! When you go for a ride, listen for the traditional calliope and organ tunes. Even though Marcus Charles Illions was such a renowned carver, the Congress Park Carousel is the only of his two-row carousels still in working order, making it a truly unique gem! 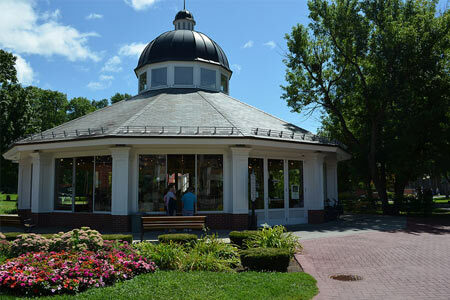 In addition to its seasonal schedule, The Congress Park Carousel is open for many special events in Saratoga Springs, including the Victorian Streetwalk in December and First Night Saratoga on New Years Eve. It can also be booked for parties, weddings, and other private functions. Call (518) 587-3550 x2471 for additional details on hours, rain dates and other information on the Congress Park Carousel.